The Belgium Grand Prix, round 13 of the 2018 season, was a strange event, but certainly one to keep the championship alive. Both Mercedes and Ferrari arrived with engine upgrades, with defining results. The practice sessions clearly displayed the Maranello team’s leap in engine power, with the spoils shared between Sebastian Vettel and Kimi Raikkonen. Then qualifying delivered a curve ball when rain struck and turned the field upside down. So it was pole for Lewis Hamilton, with Vettel alongside. Row two belonged to Force India team drivers Esteban Ocon and Sergio Perez, followed by Haas’ Romain Grosjean and Raikkonen, and on row four Red Bull’s Max Verstappen and Daniel Ricciardo. The start was the real game changer. Vettel grabbed the lead from Hamilton with the two Force Indias in close company, but it was further back that it all went wrong. Renault’s Nicolas Hulkenberg, out-braked himself and slammed into the rear of McLaren’s Fernando Alonso. 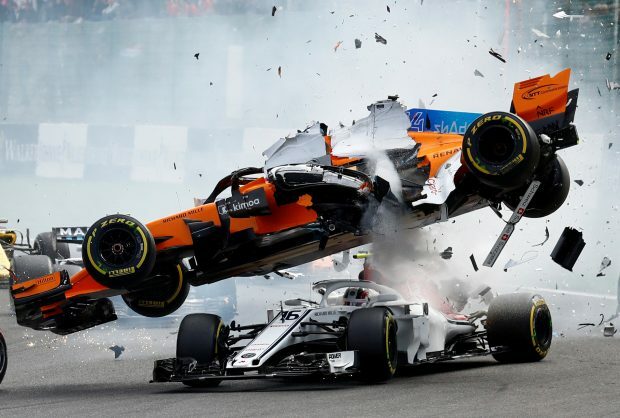 The Spaniard’s car was launched into the air, landing on the Alfa Romeo Sauber of Charles Leclerc. The safety car was immediately deployed. Other casualties were Raikkonen, who later retired his Ferrari due to undertray damage and Ricciardo, whose rear wing had to be changed in a long pit stop. Another consequence of the incident was Valteri Bottas’ Mercedes running into Sergei Sirotkin’s Williams, resulting in a steward’s investigation. Bottas was handed a five-second time penalty, not affecting his result, plus two penalty points. Hulkenberg was not so lucky, being found responsible for the initial fracas. The result is a 10 grid position drop for the next race and three penalty points on his licence. The restart saw Hamilton attempting to grab the lead from Vettel, but the challenge failed. Despite quickest laps from the reigning champion he could not close the gap to the German who went on to win comfortably and reduce the driver’s points gap to just 17. Verstappen had a well-earned third place in a car that was certainly no match for the leading pair. That extra power and determination saw a good drive from Bottas making his way up to fourth spot and accumulating valuable championship points. Another gap in the 2019 driver line up was closed when Red Bull announced the appointment of Pierre Gasly, current Toro Rosso driver, to the senior Red Bull team. The young Frenchman’s experience with the Honda powered junior team will be invaluable to Red Bull, plus his race craft and turn of speed. Alongside Verstappen, it could be an exciting team to watch, providing the Japanese partner can guarantee reliability and performance of the power unit. The driver line-up for next season was further complicated when Force India confirmed that Esteban Ocon is out of the team – quite when is the question. Many say almost immediately, while others do not expect Lance Stroll to join Force India until 2019. My guess would be a change within the next few races and the outcome could be a move to Williams for Ocon. As part of the Mercedes young driver programme and the fact that the team is Mercedes powered, it could suit all concerned. Unfortunately, this could also prevent the return of Robert Kubica, currently reserve driver and a favourite of many. Another rumour is that he will join Carlos Sainz at McLaren as a replacement for Vandoorne. This weekend it is round 14 at the Monza circuit for the Italian Grand Prix. It’s a circuit that could well suit the new-found speed of the Ferraris, which appear to have the edge over Mercedes at present. But that is certainly not a foregone conclusion. Home turf is certainly no guarantee of success, as Maranello can testify, but the dedicated supporters will be cheering them on.